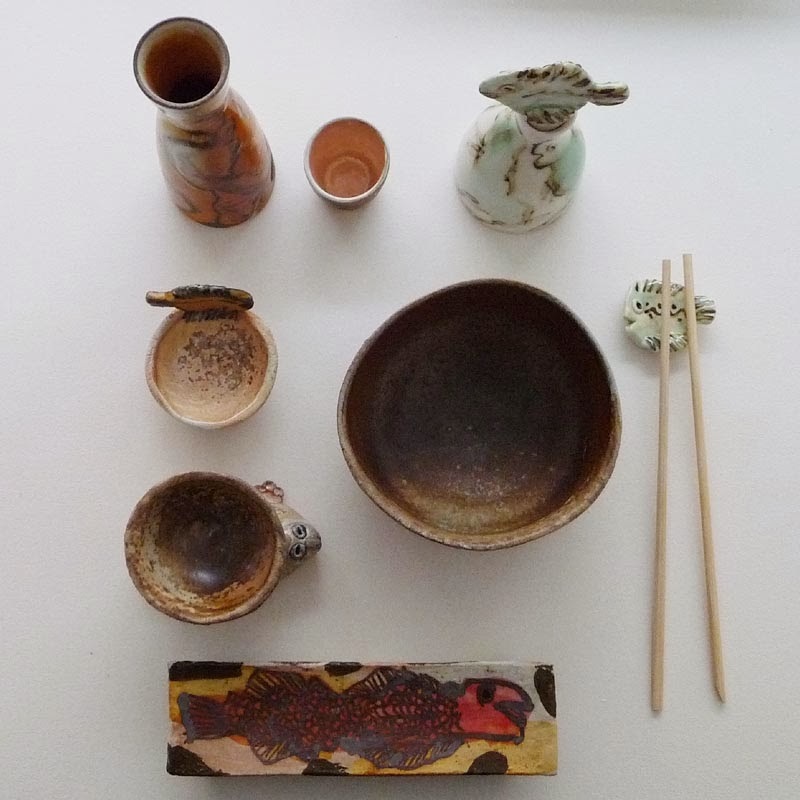 CLICK photo = LARGE format + slide show ..
Each week in December a new unique table will be set for sushi, dinner, coffee/tea - in play with untraditional objects by the gallery artists.. 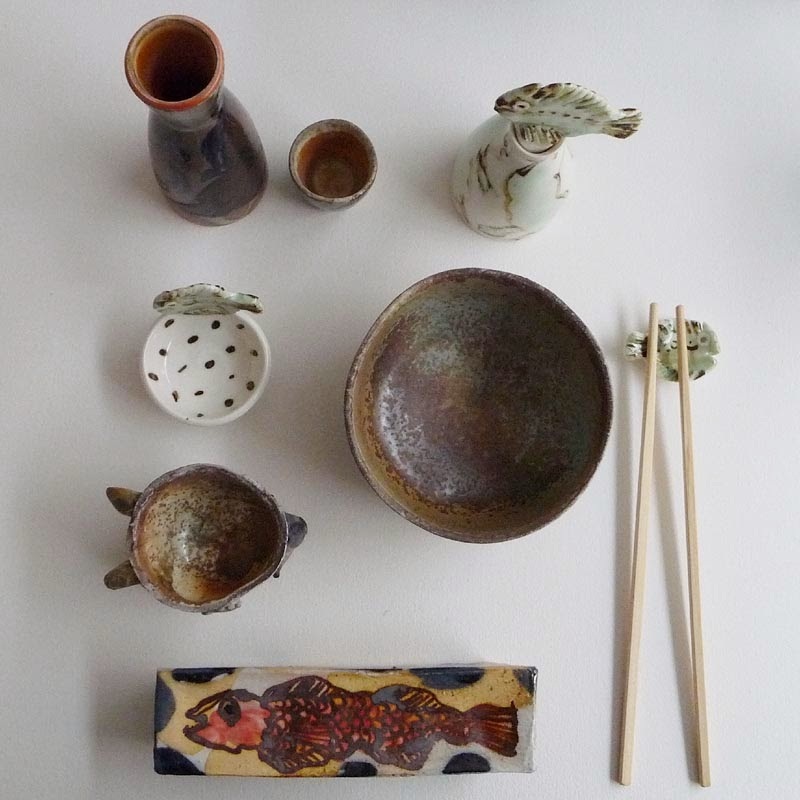 The first table setting is THINGS FOR SUSHI by Sten Lykke Madsen. 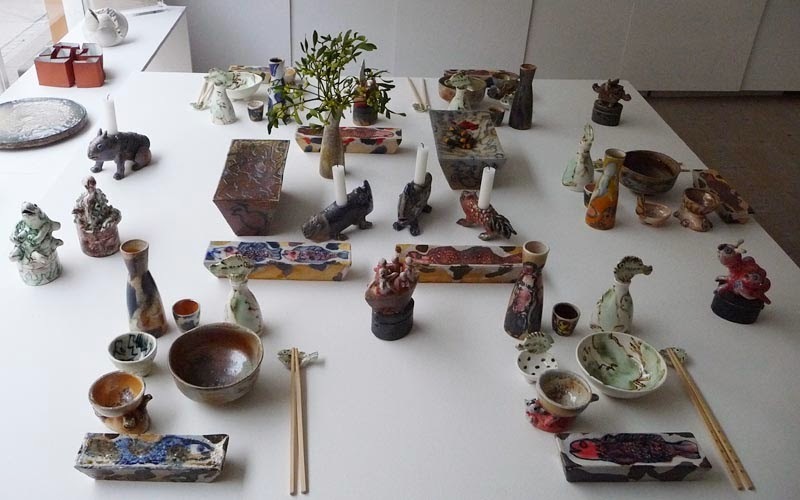 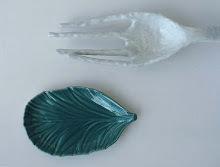 An other table setting is DREAM LANDSCAPES by Ann Linnemann. 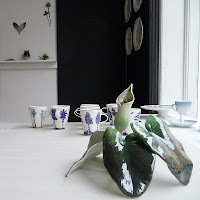 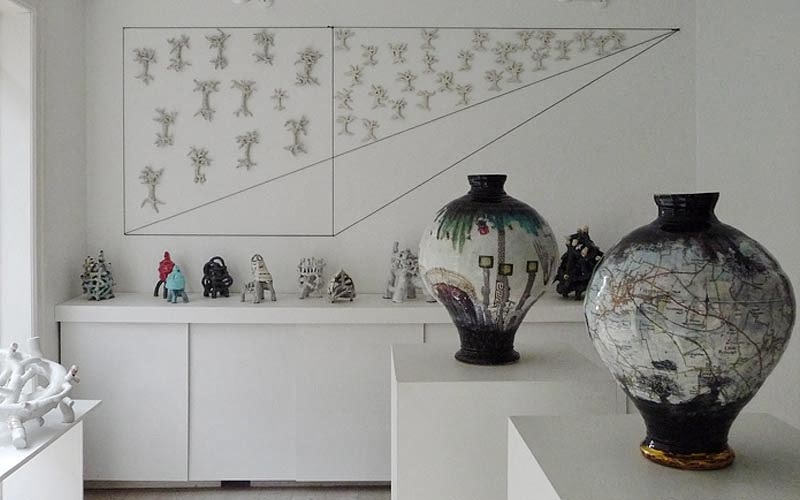 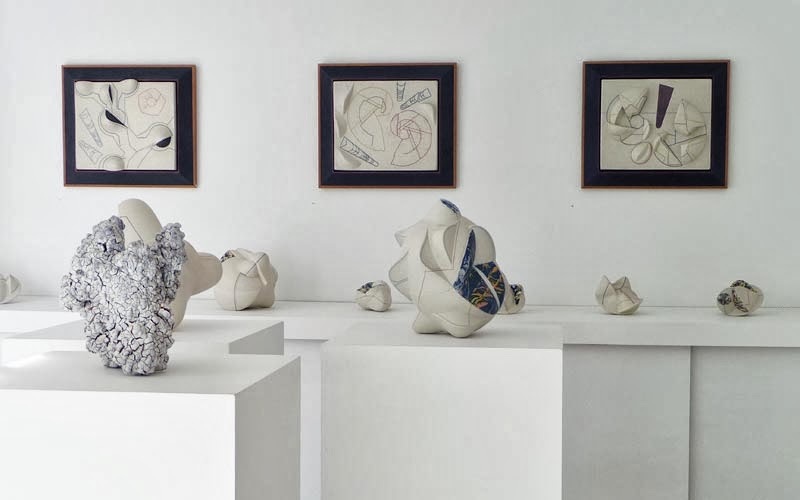 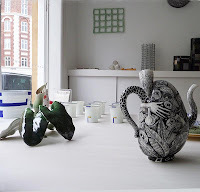 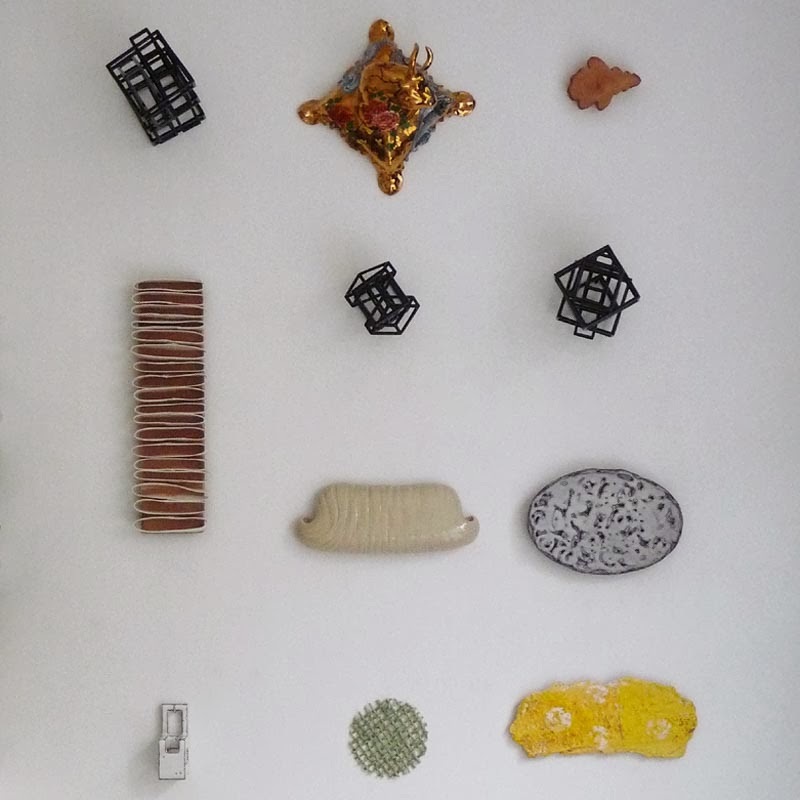 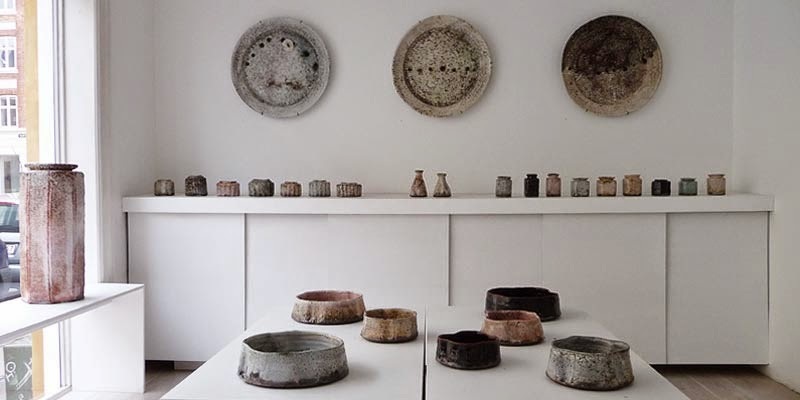 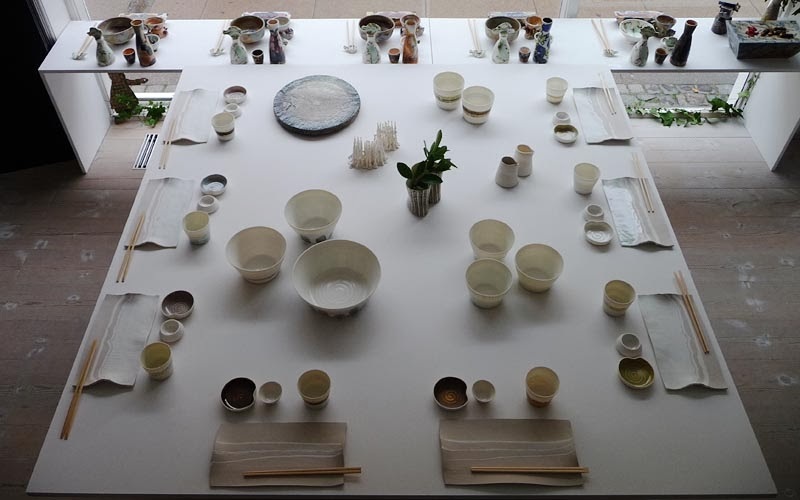 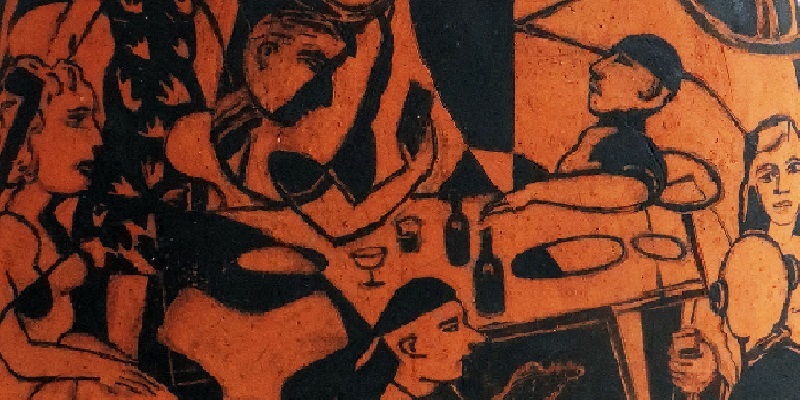 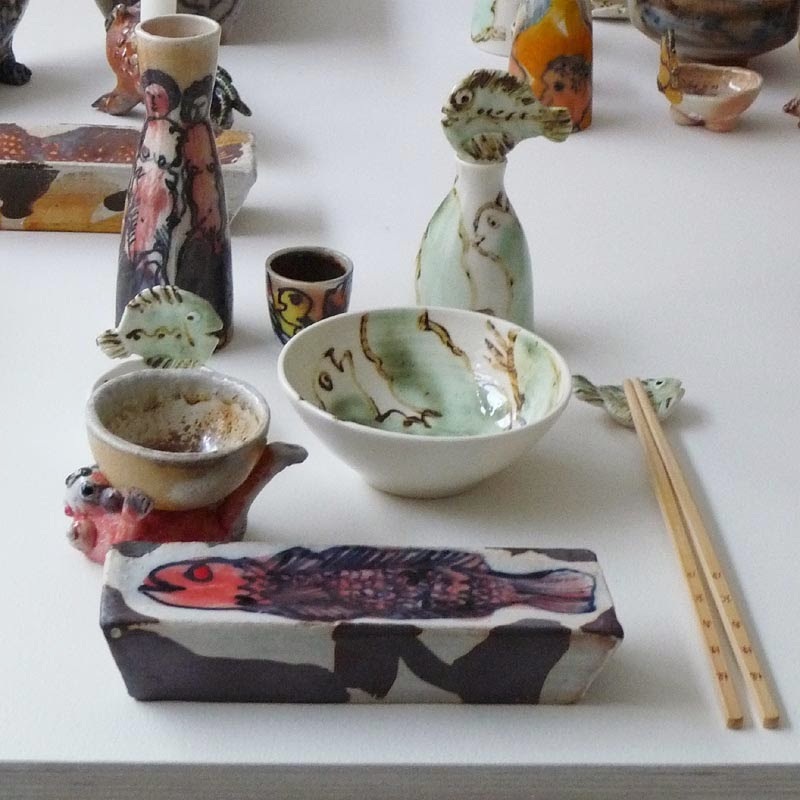 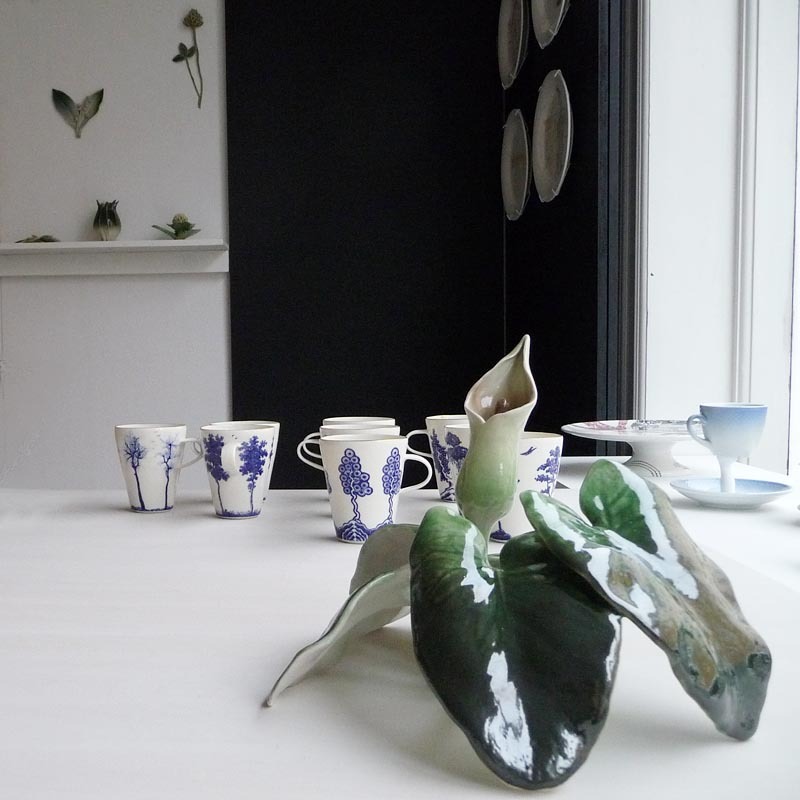 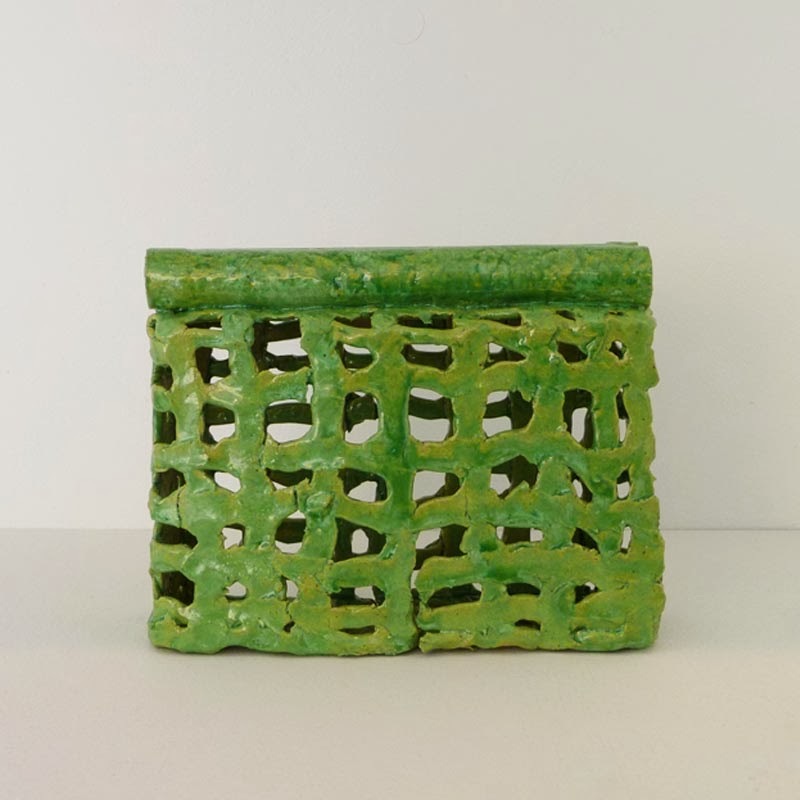 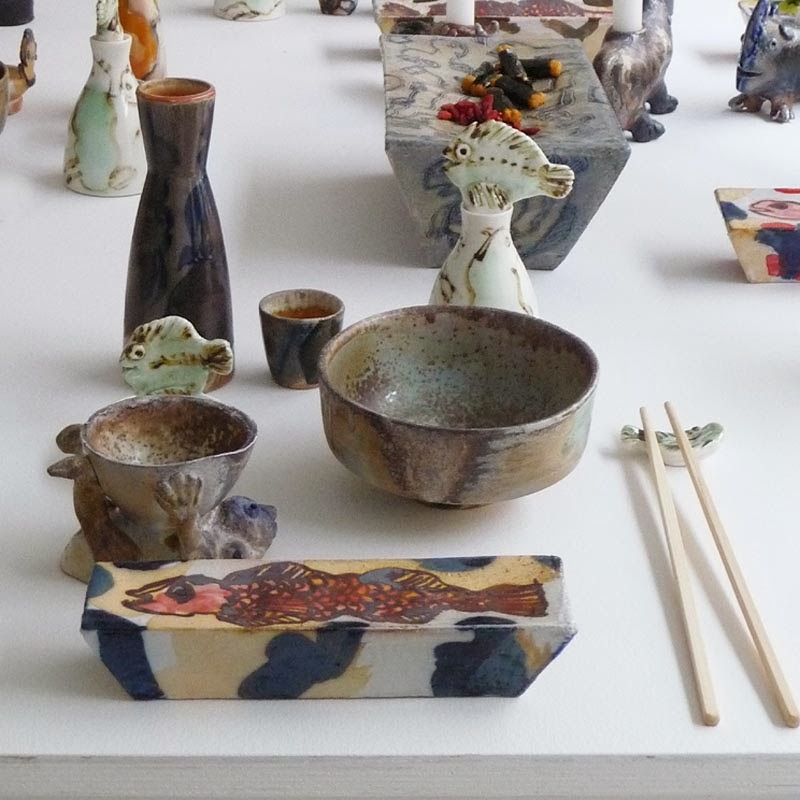 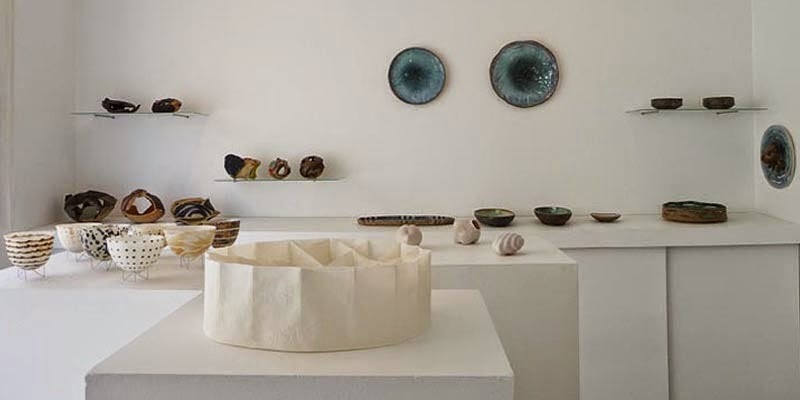 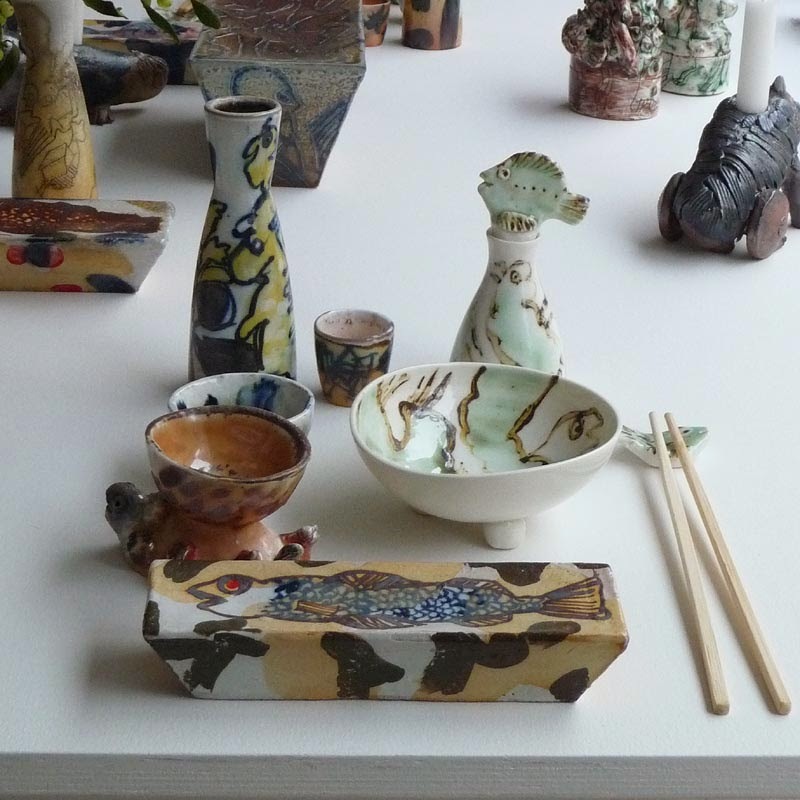 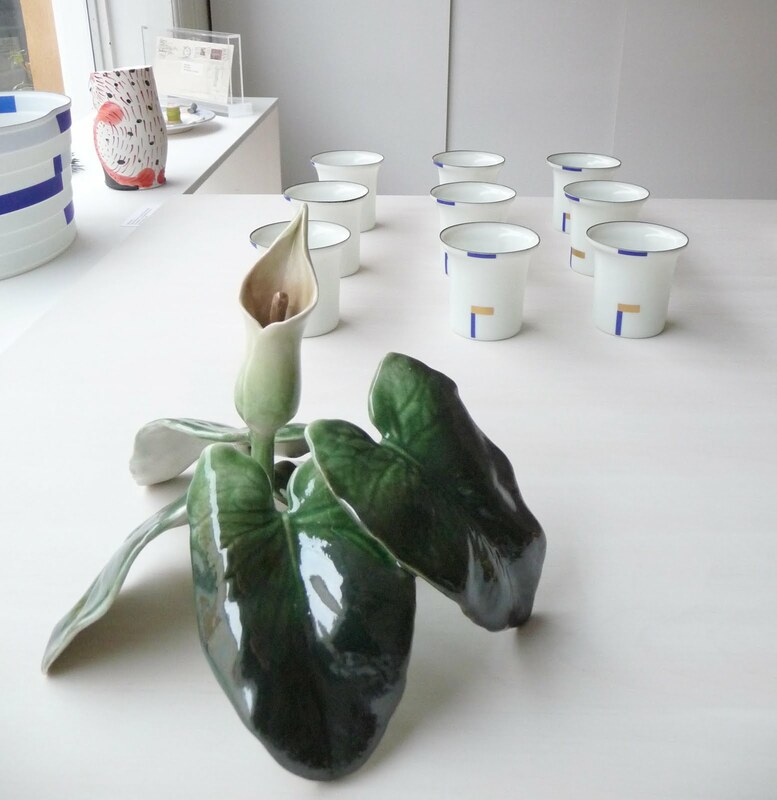 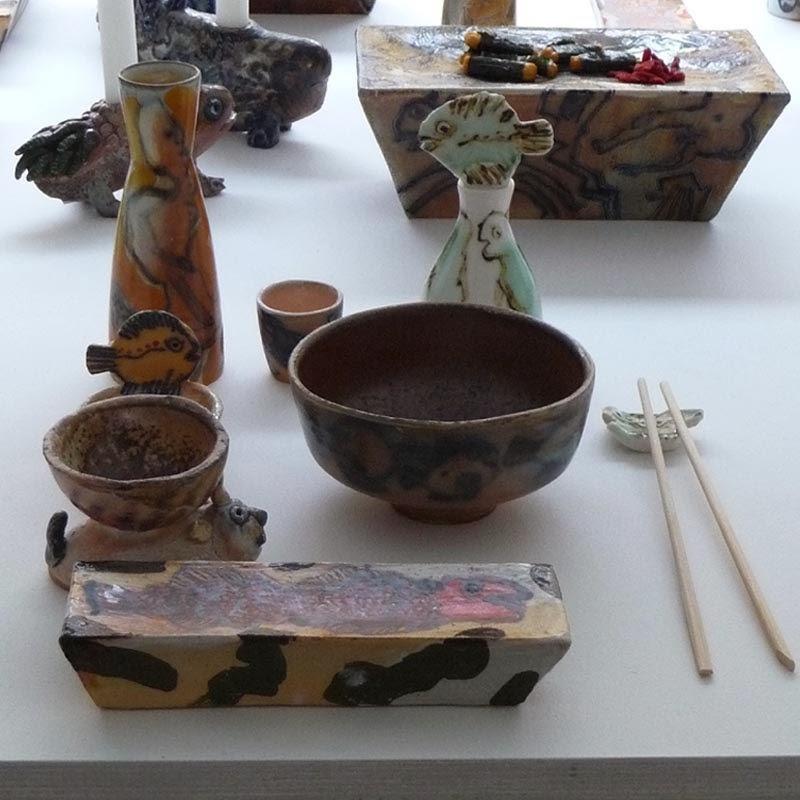 The Gallery shows a 'dining room' filled with special original pieces and focuses on the collectables describing people, presence, art and love of material, craftsmanship, aesthetics, social and political concepts in ceramic art of our time. 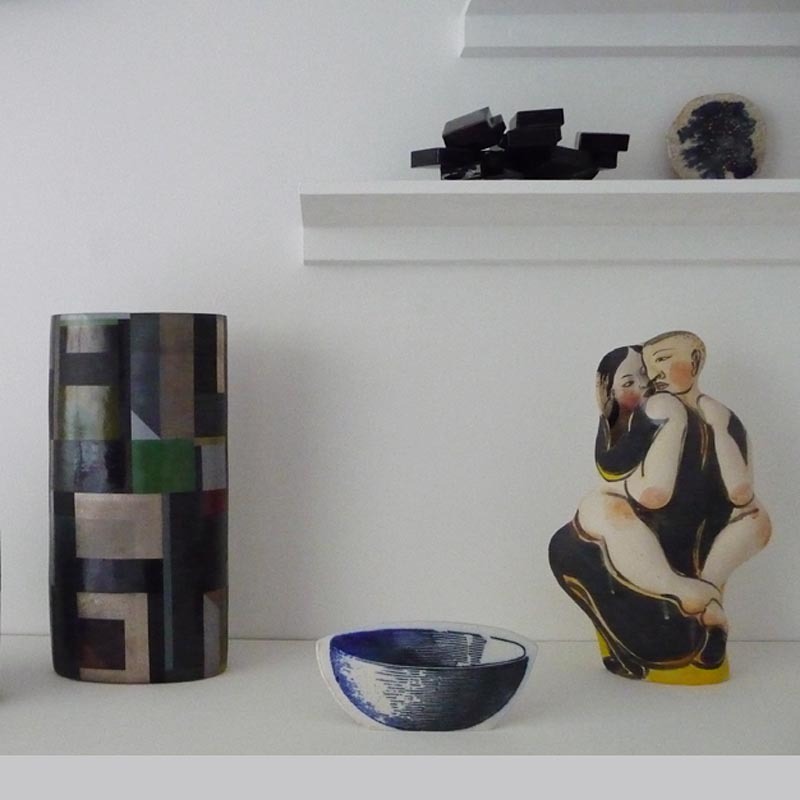 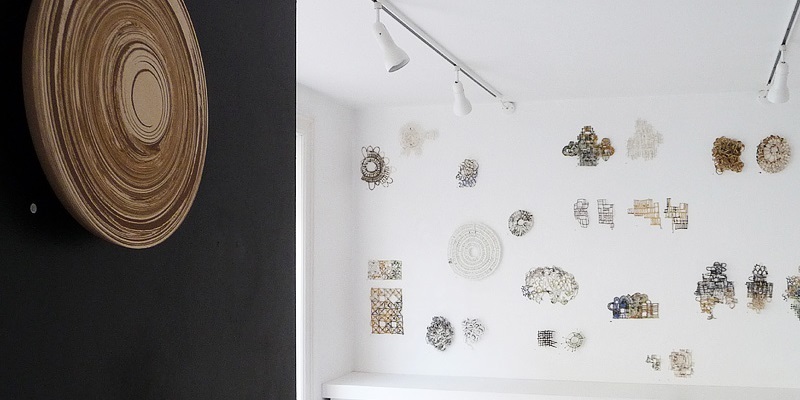 How do we live in a home full of a passionate ceramic collection? 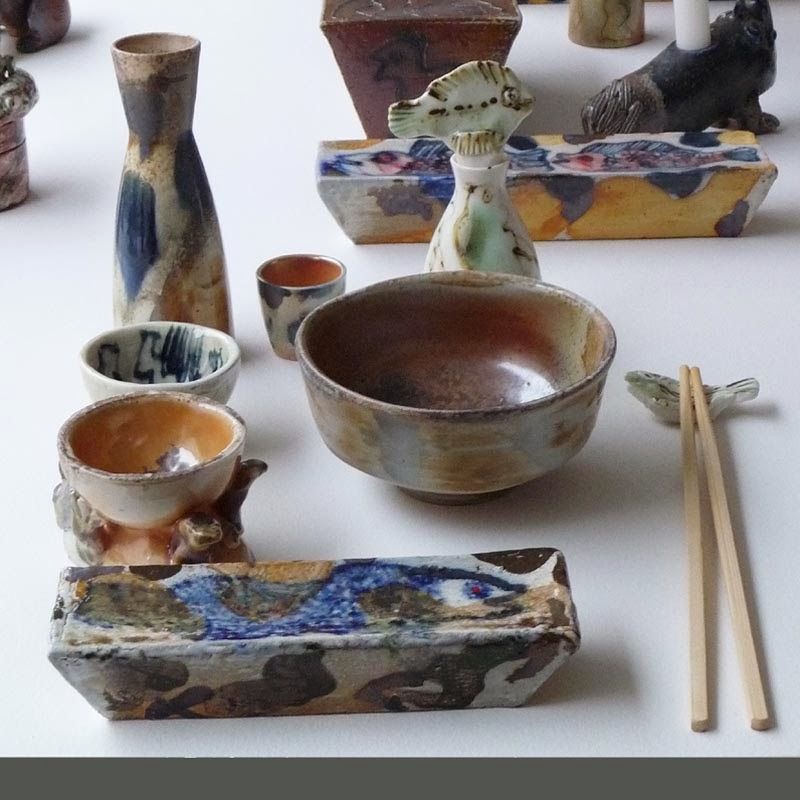 Ceramics are traditionally evaluated for functional values and valued as art objects.. - Functional design, craftsmanship or artistic value? - All together this also just shows a desire for life and multiple ways of telling the stories, we do need to see and remember every day. 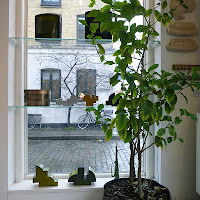 SELECTED PIECES AND ARTISTS - A COLLECTOR FOR DINNER..
SEE Gallery collectables - LINK! 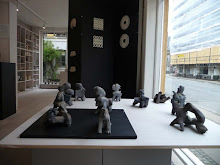 Sten Lykke Madsen Sten Lykke Madsen is recognized for his fabulous humorous figures, that in funny ways bring the viewer into a different world of hybrids between animal and human. 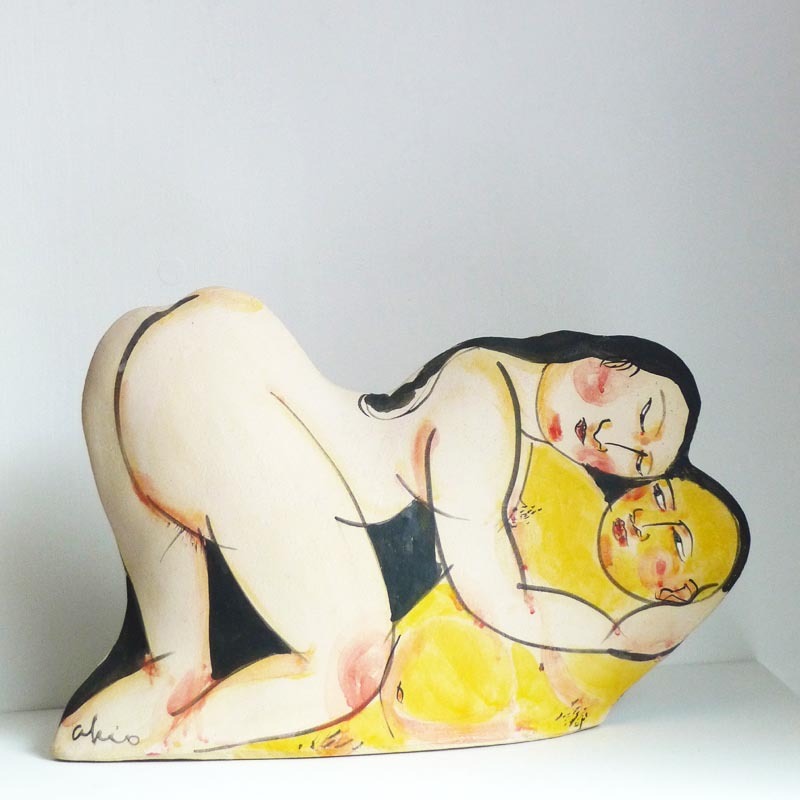 The themes of eroticism and love are always present in Sten Lykke's motives. Sten Lykke Madsen was born in Copenhagen, Denmark, where he trained at the Art, Craft and Design School. 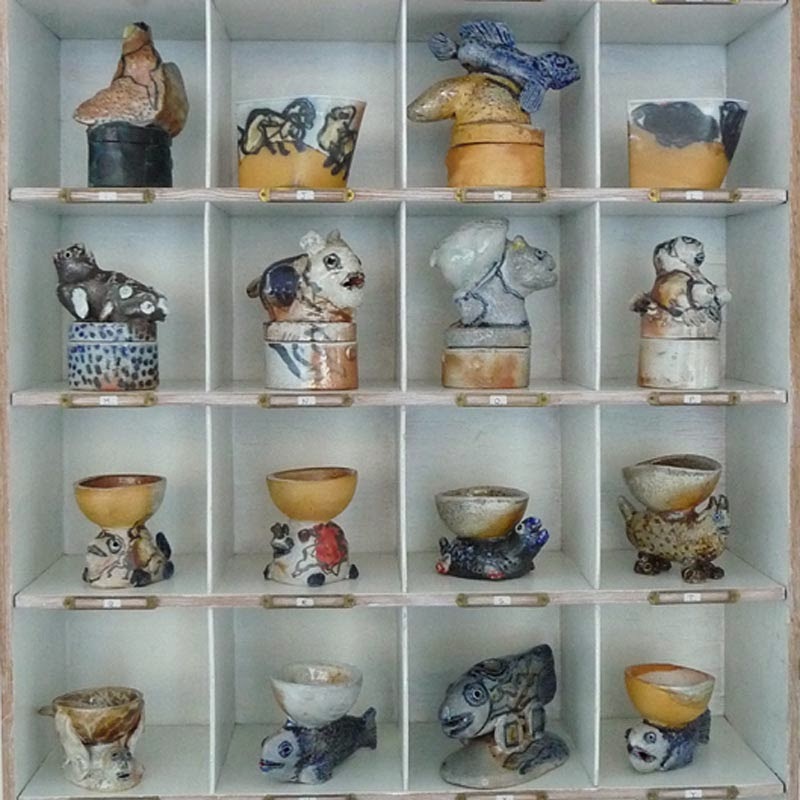 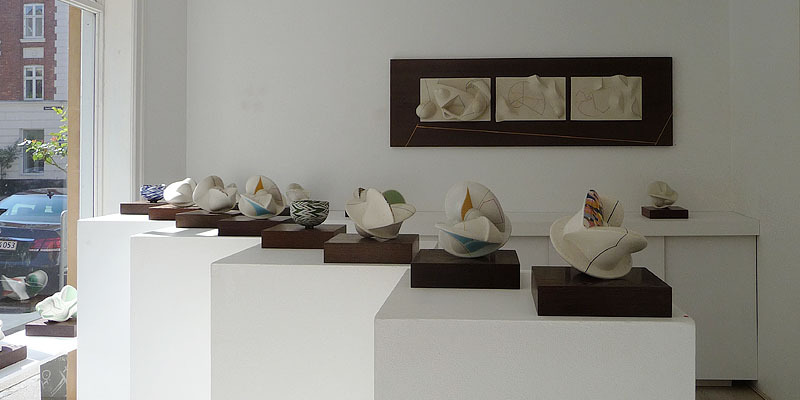 He has been a professional ceramic artist since 1958. 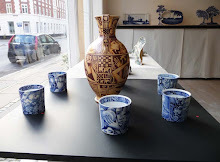 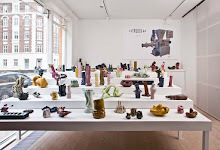 His work has been shown in numerous solo and group exhibitions both in Denmark and overseas, and is in the collections of the Victoria and Albert Museum, London; Boymans-van Beuningen, Rotterdam; Museo Internazinale delle Ceramice, Faenza and many other museums. 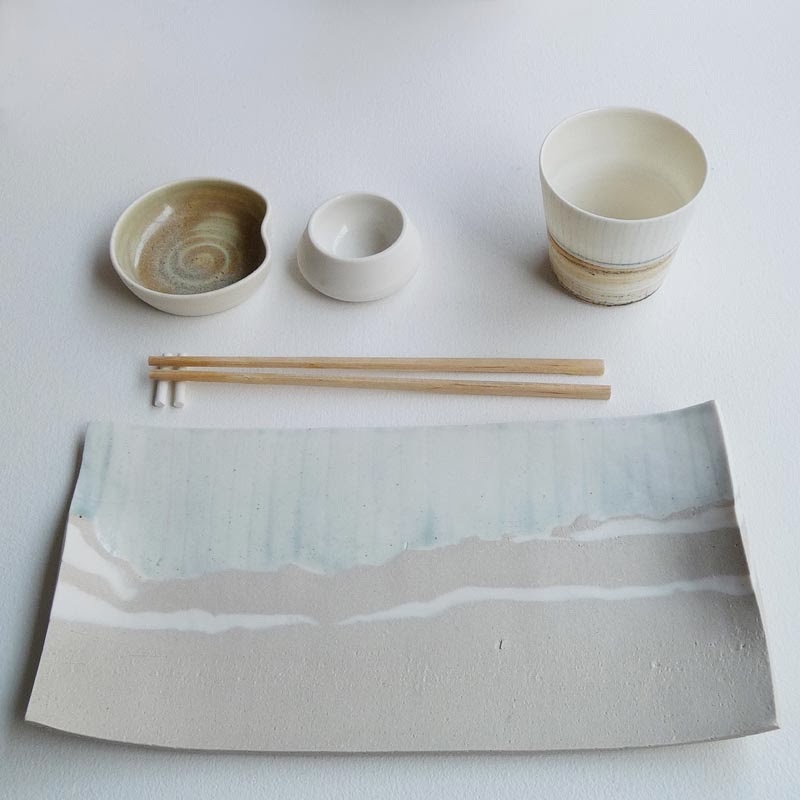 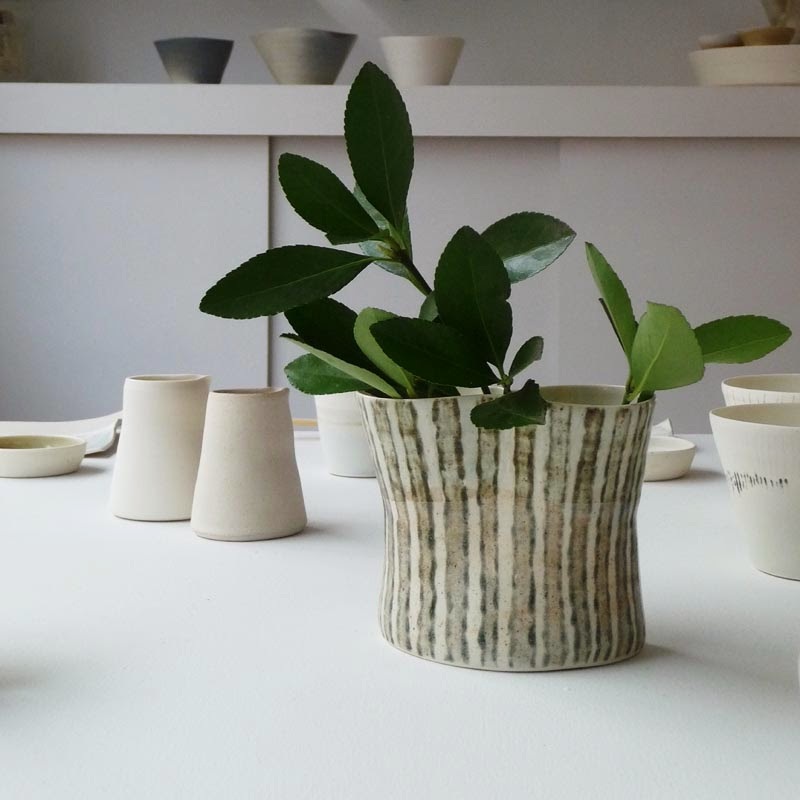 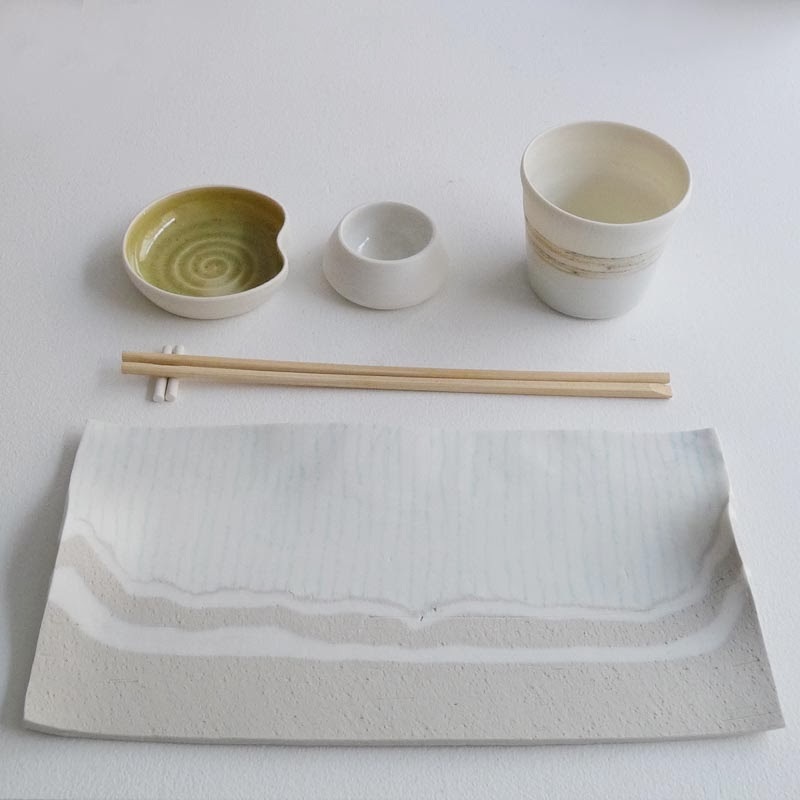 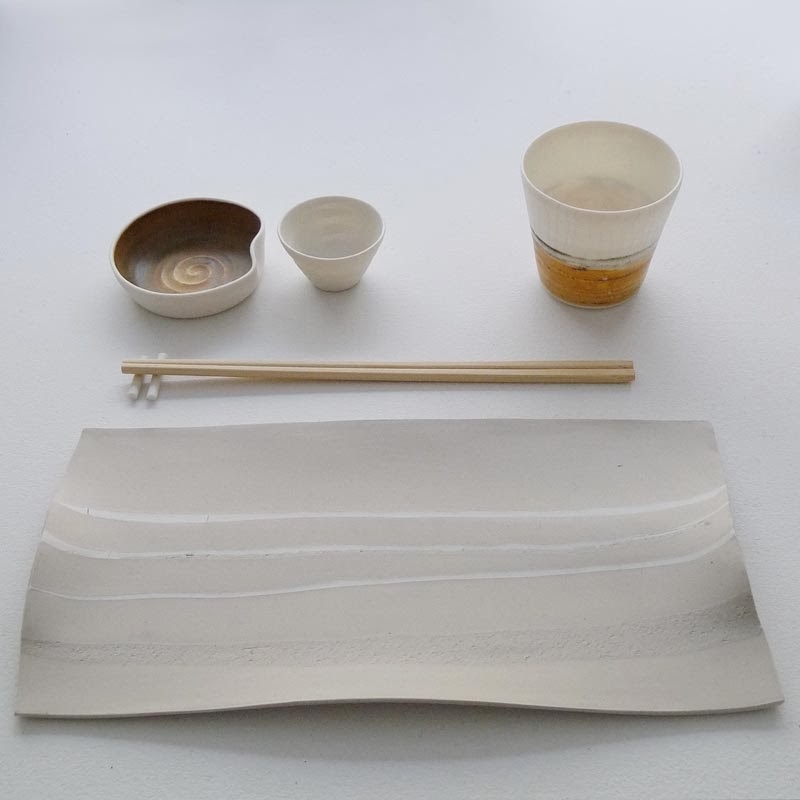 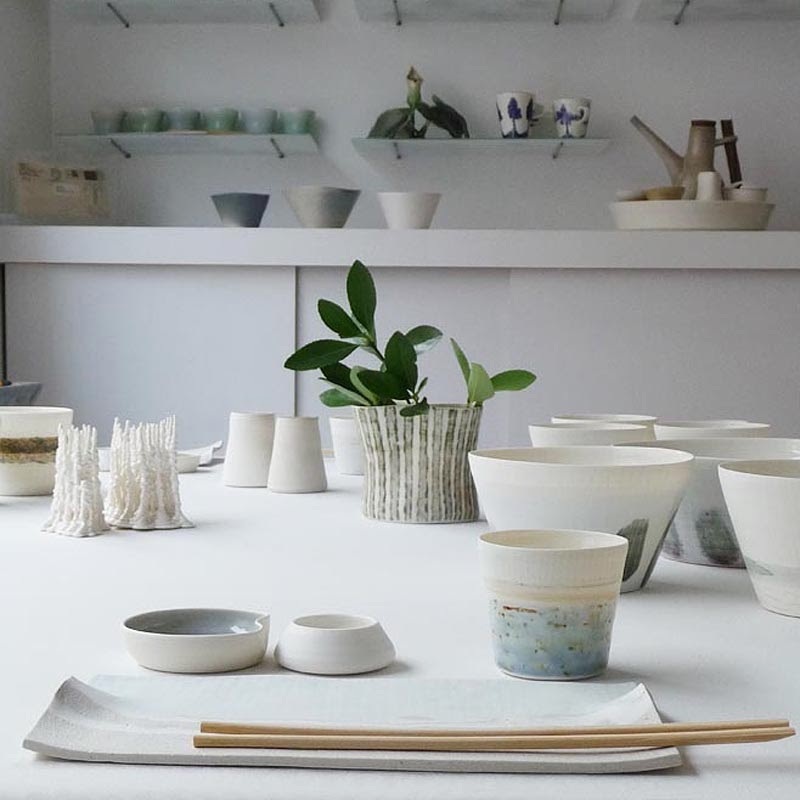 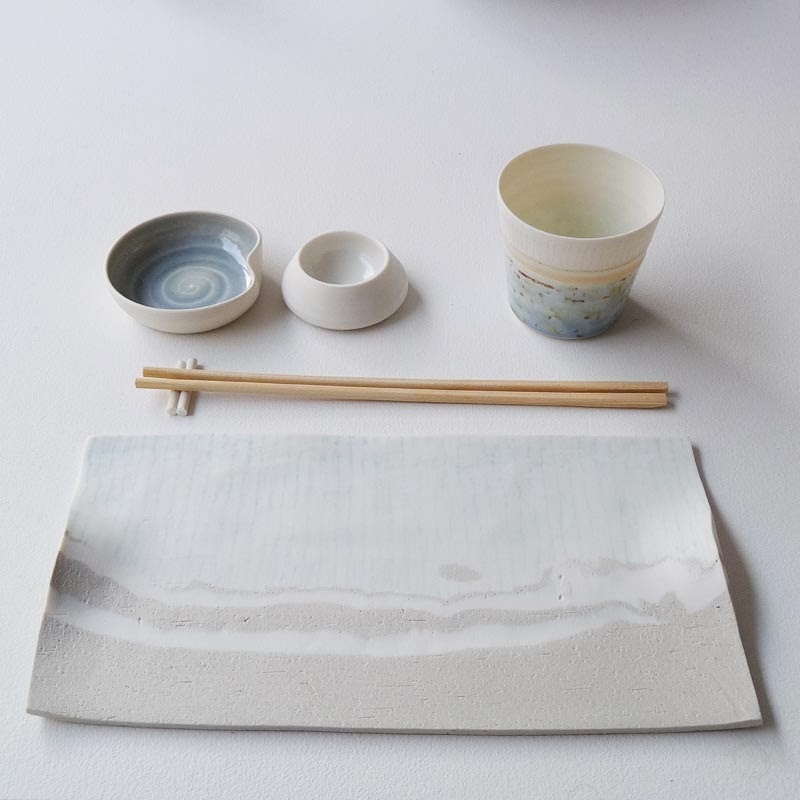 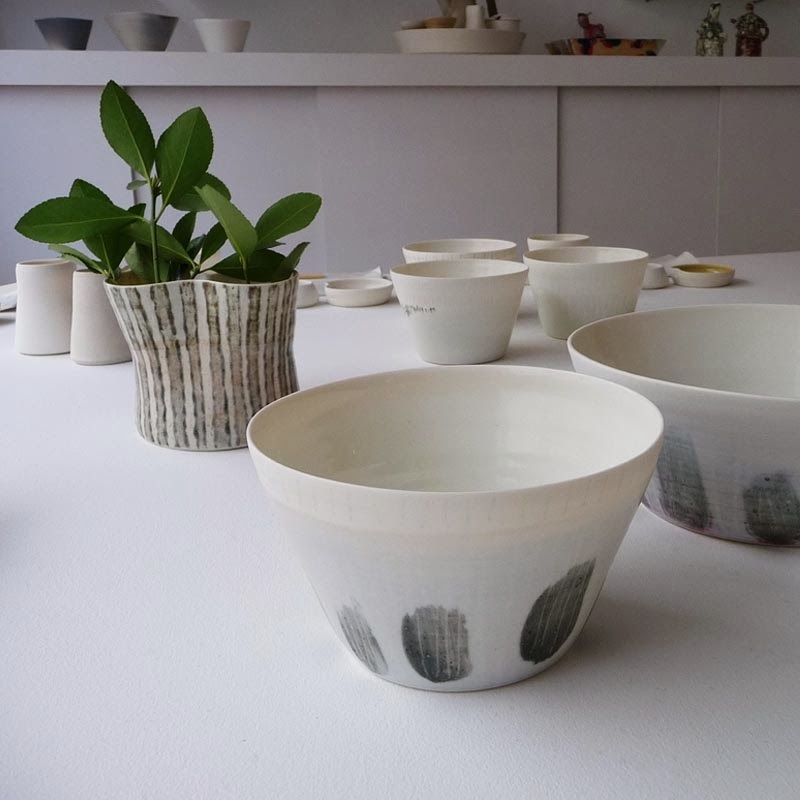 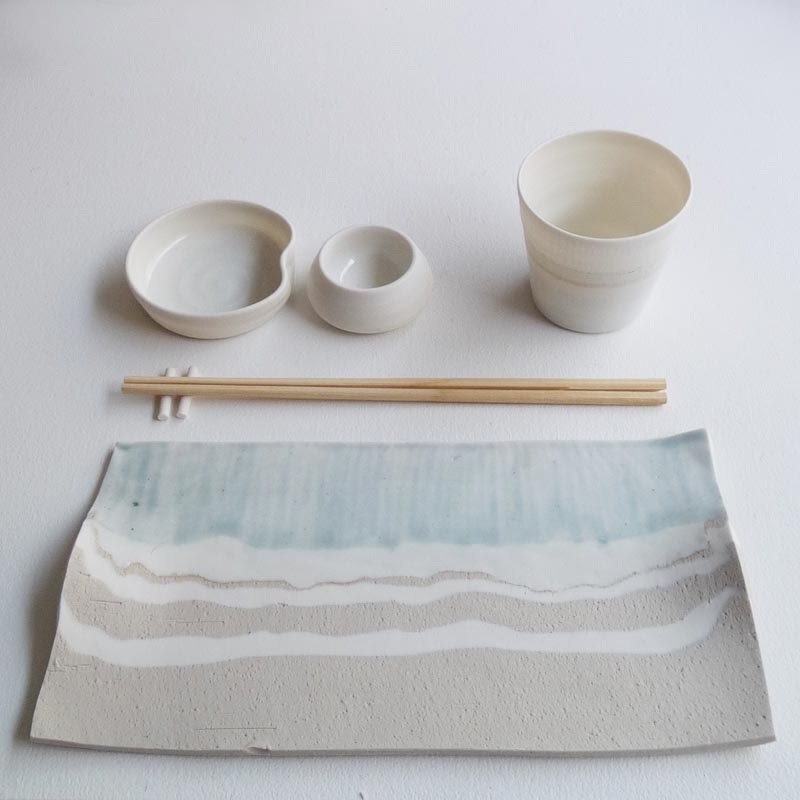 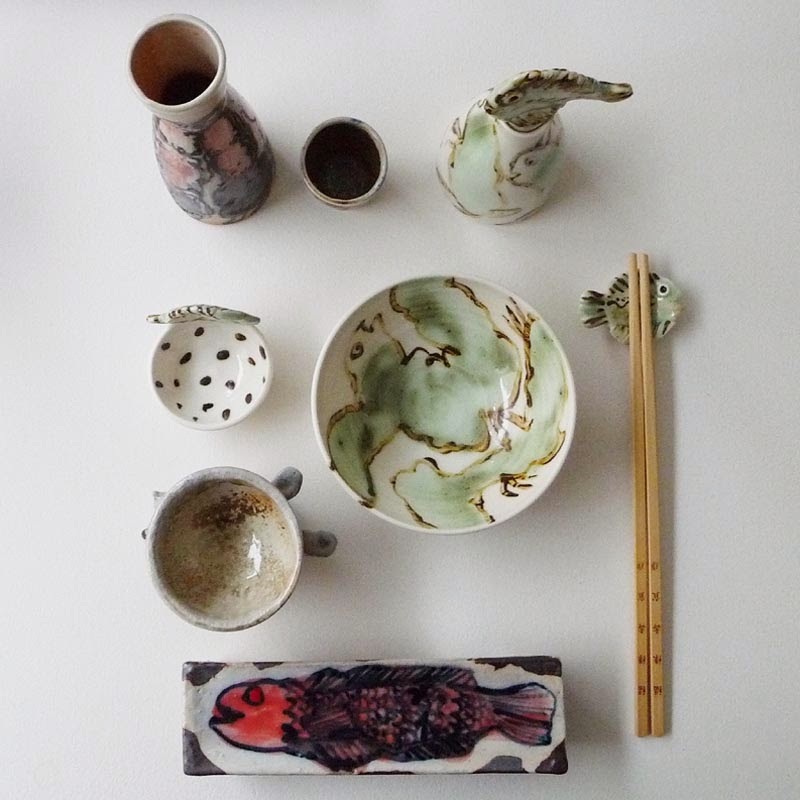 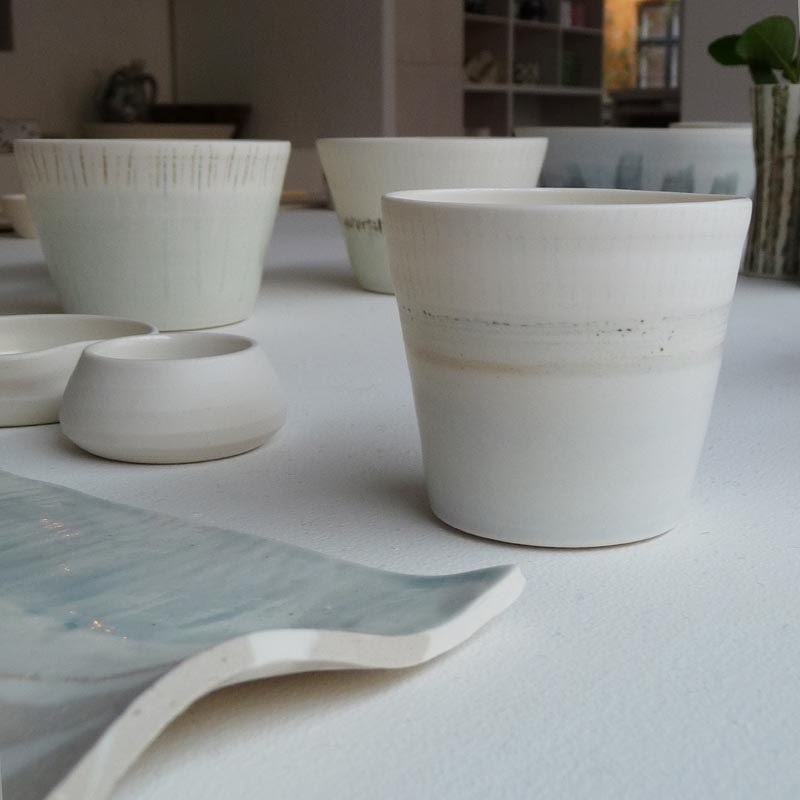 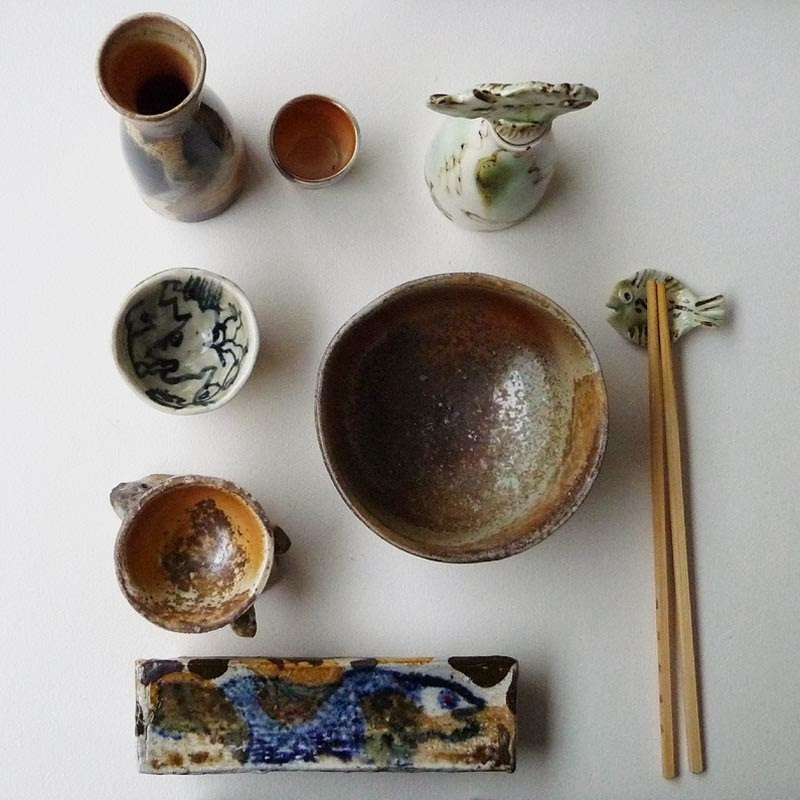 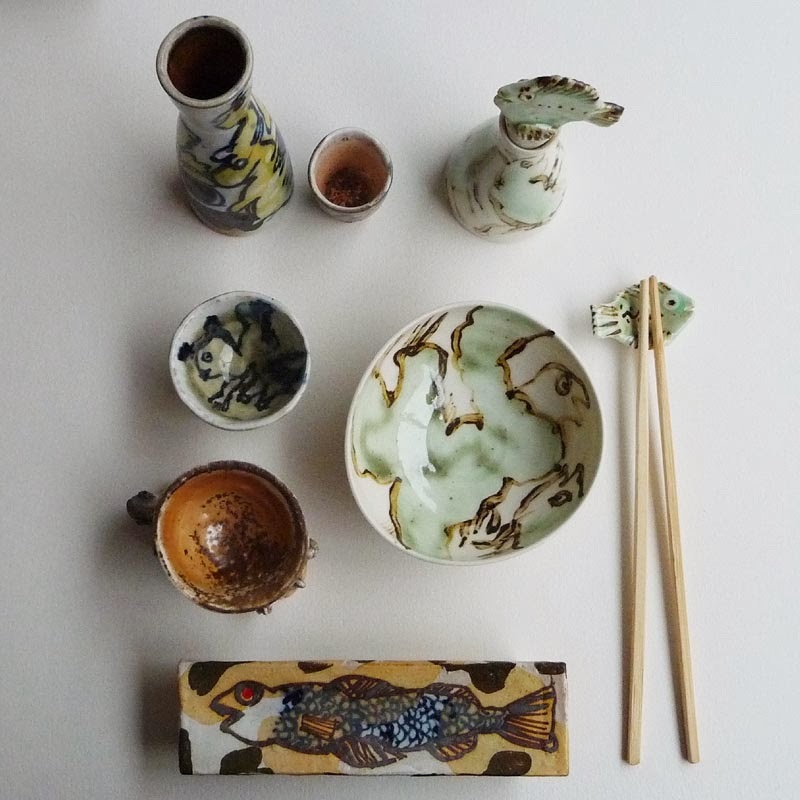 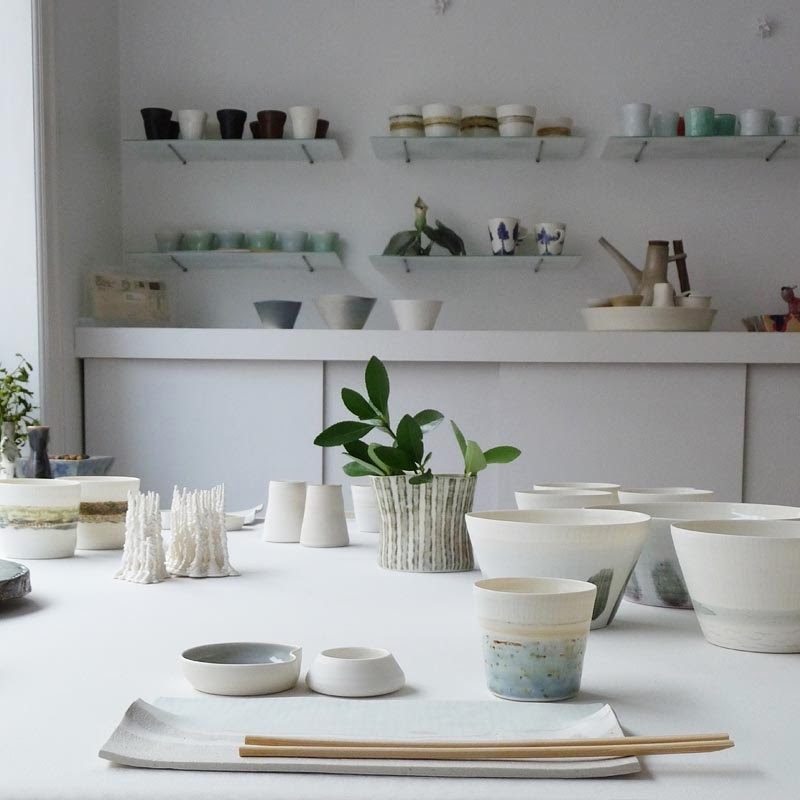 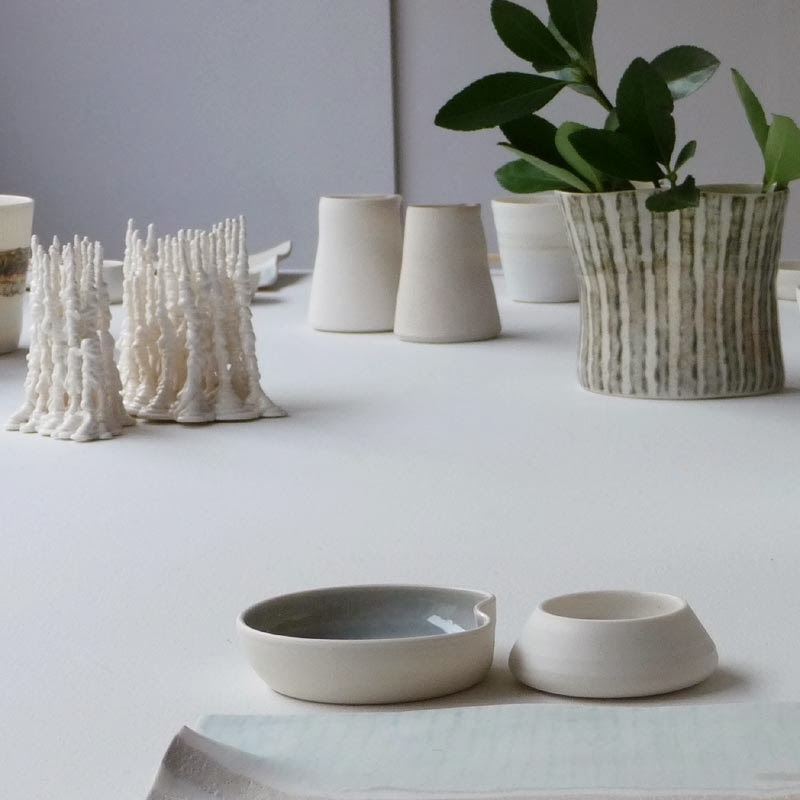 Ann Linnemann (DK) shows hand-thrown porcelain for sushi dinner, lunch and coffee in white and a hand-painted seasonal landscape series. 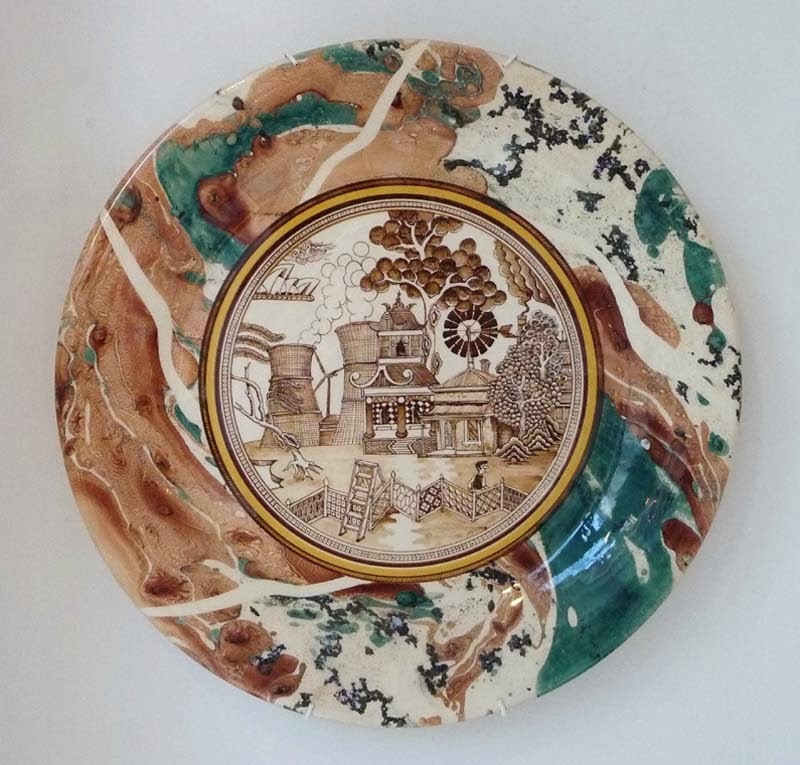 The nature theme gives each piece a personal story. 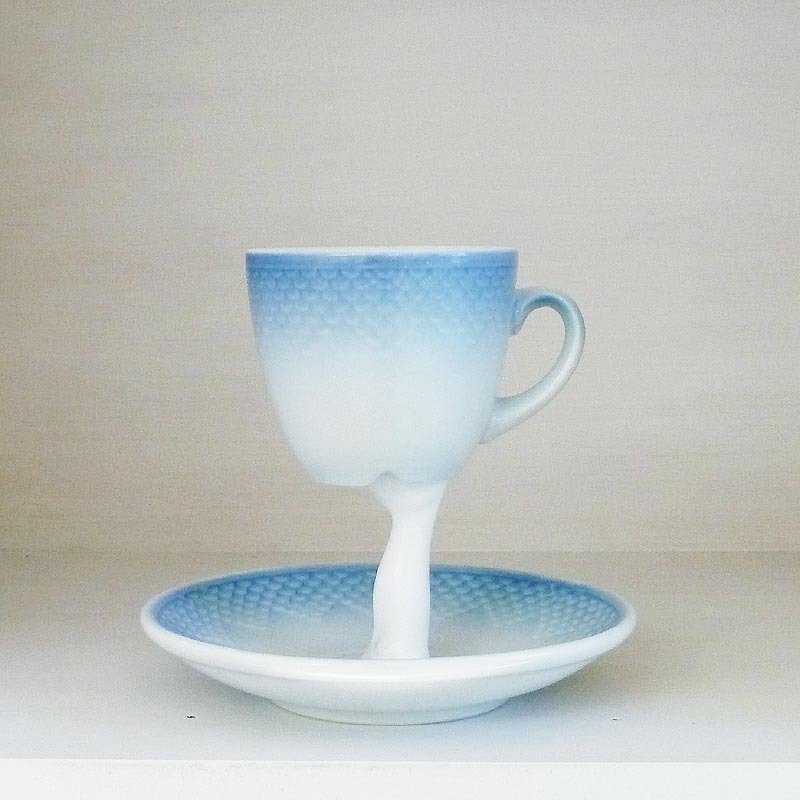 Paul Scott og Ann Linnemann (UK/DK)- Landscape Blue series holds cups and paltes with cobolt blue silkscreen print and gold/silver rims on hand-thrown transparent poecelain. 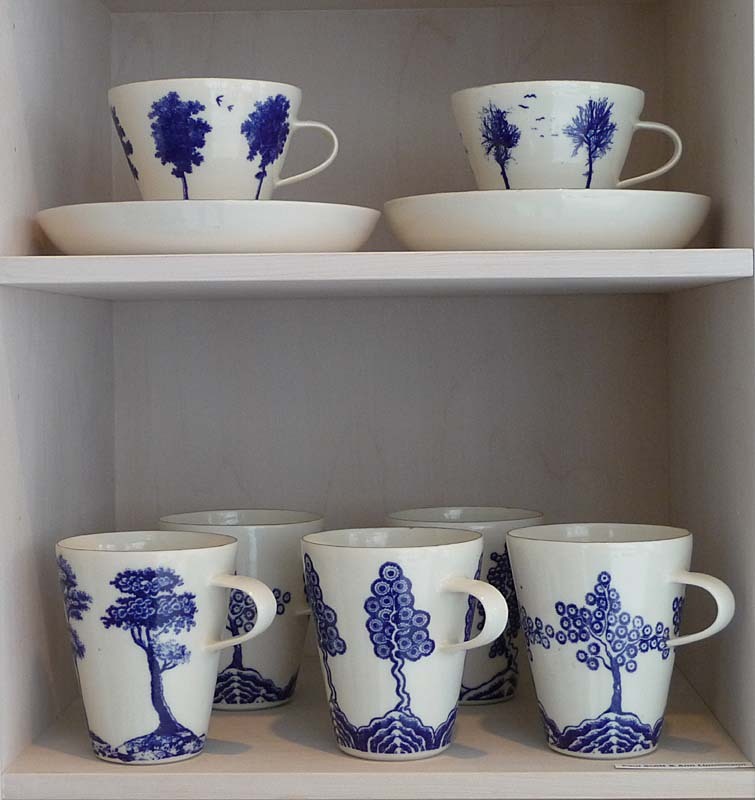 The motives are trees and ornaments from old tableware. 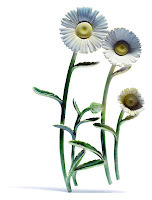 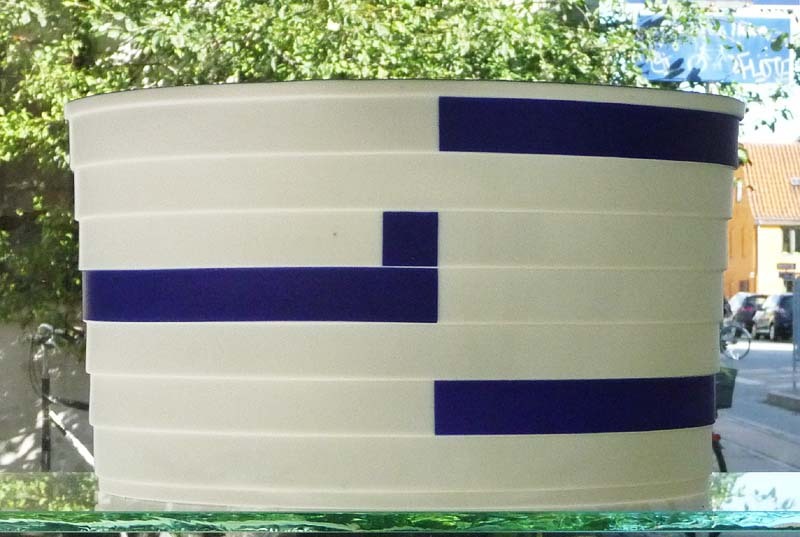 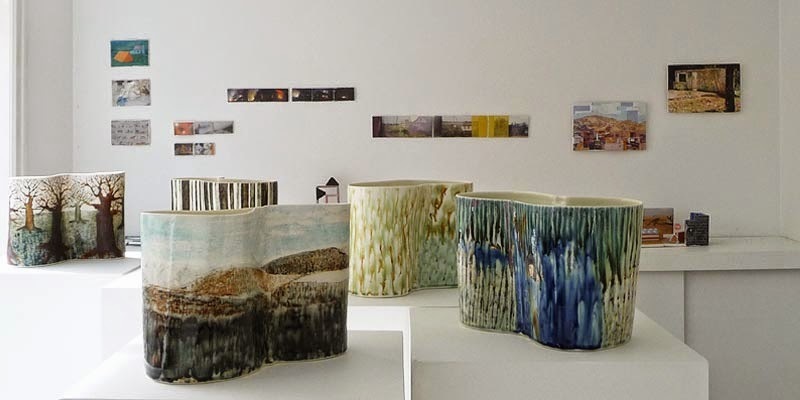 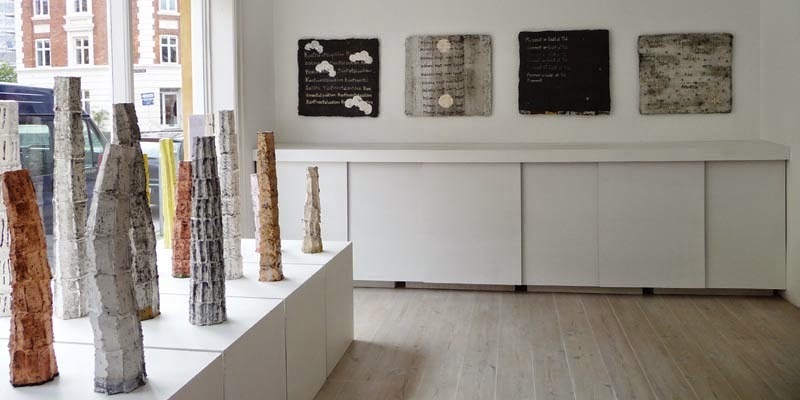 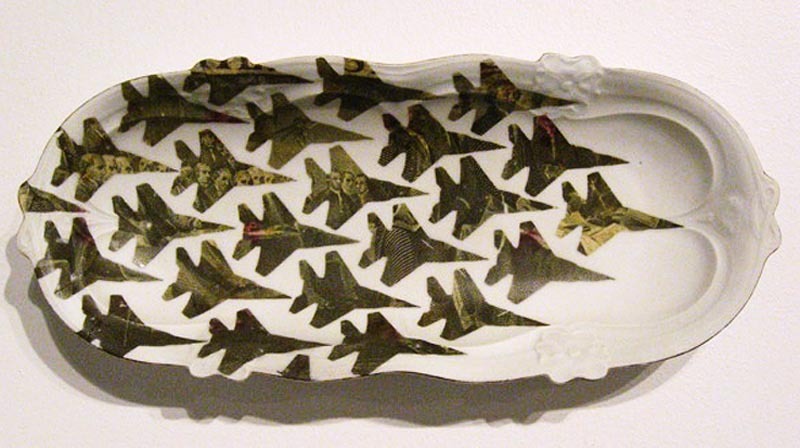 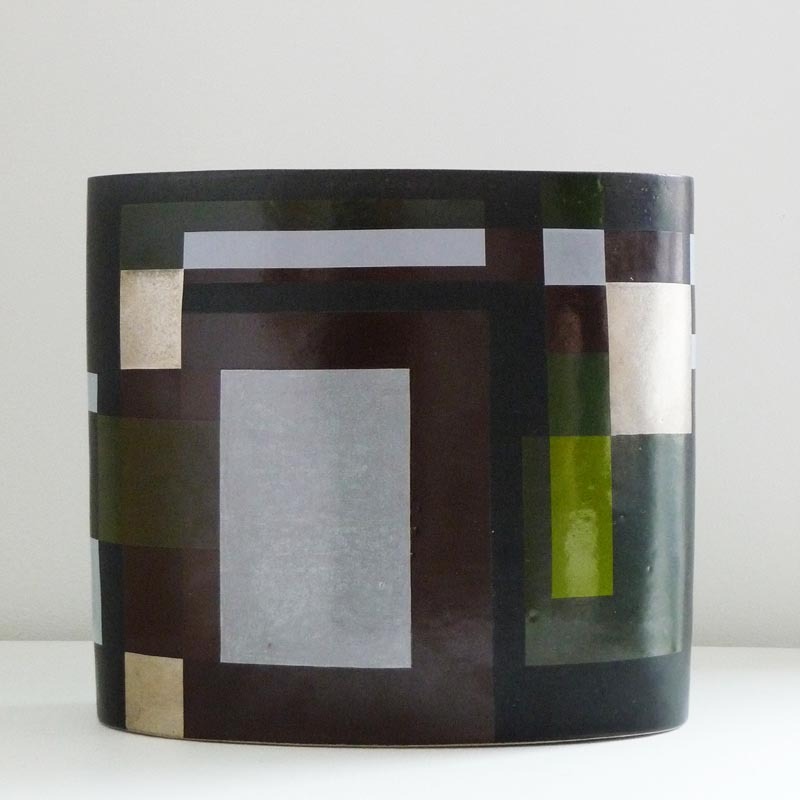 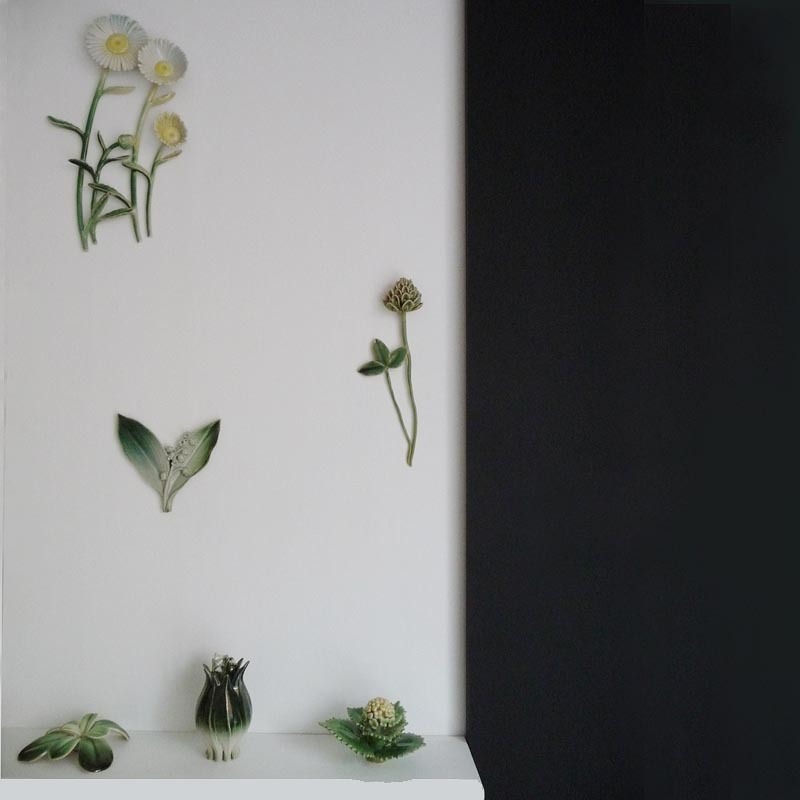 Bodil Manz is internationally acknowledged for her thin transparent porcelain cylinders with graphic transfers. 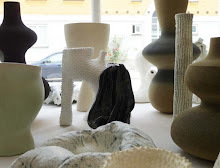 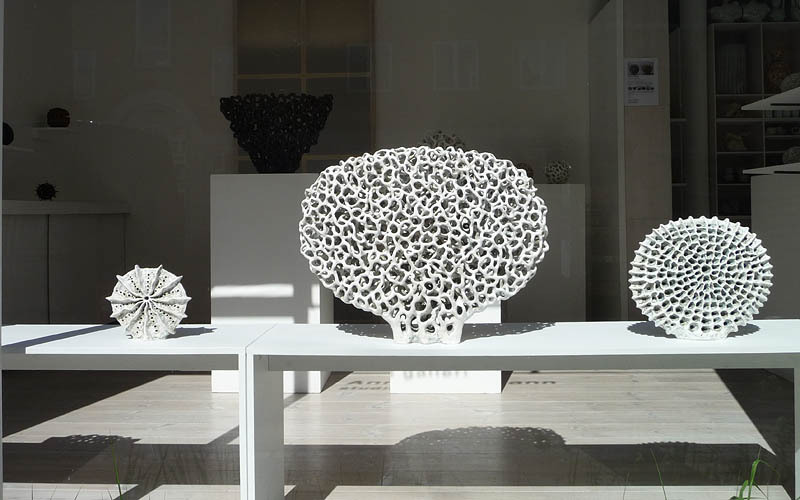 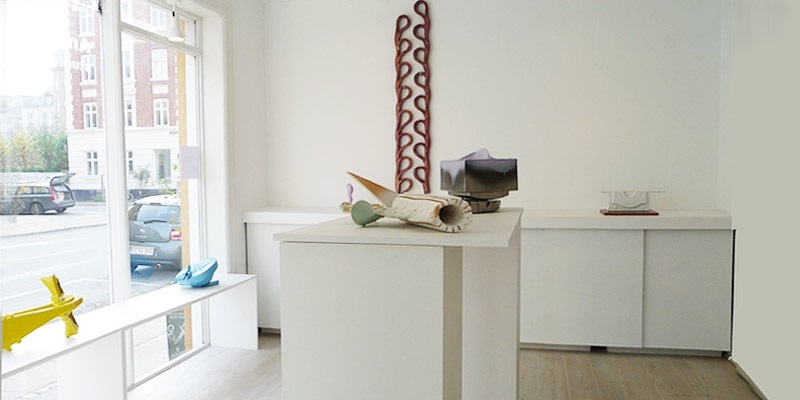 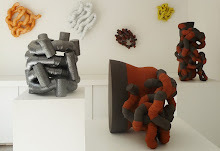 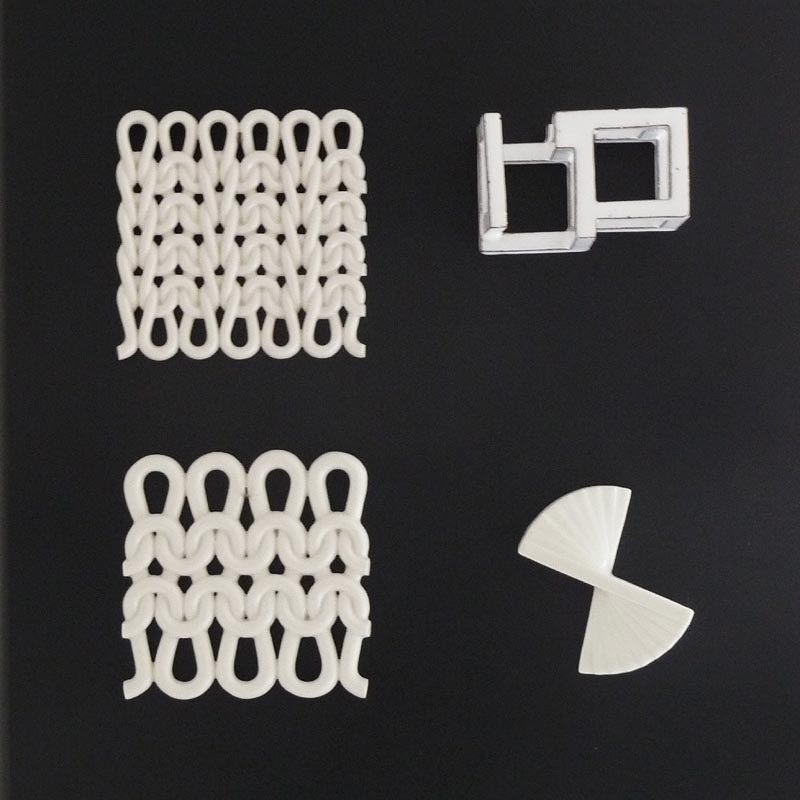 The pieces were especially selected for the exhibition FRAGILE in June 2012 – One piece has an unusual organic form in contrast to the strict graphic lines at the cylinder form, that Bodil is mostly known for. 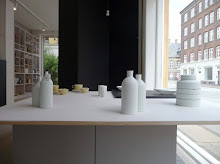 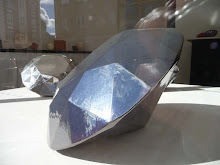 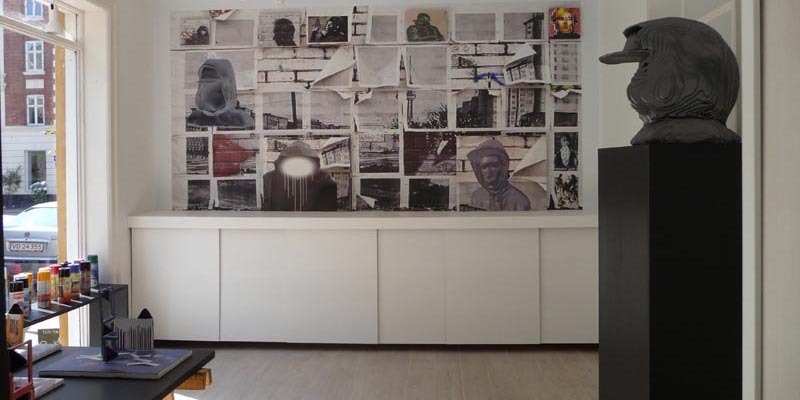 Esben Klemann is educated at the Royal Danish Academy of Art in Copenhagen. 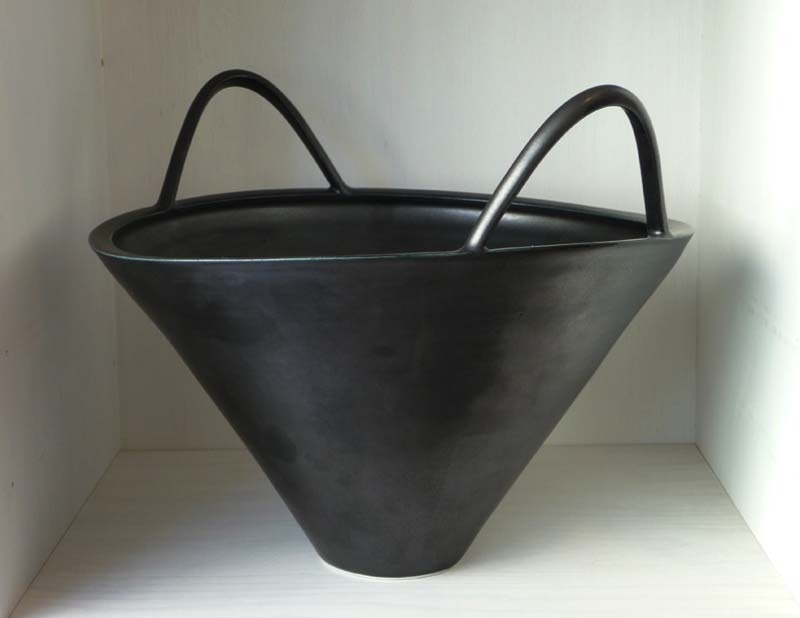 He is known for his remarkable sculptural and architectonic pieces, commission projects in Denmark and abroad. 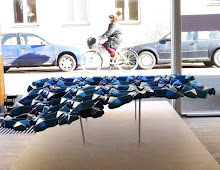 He works freely with architectural pieces for public space and exhibition. 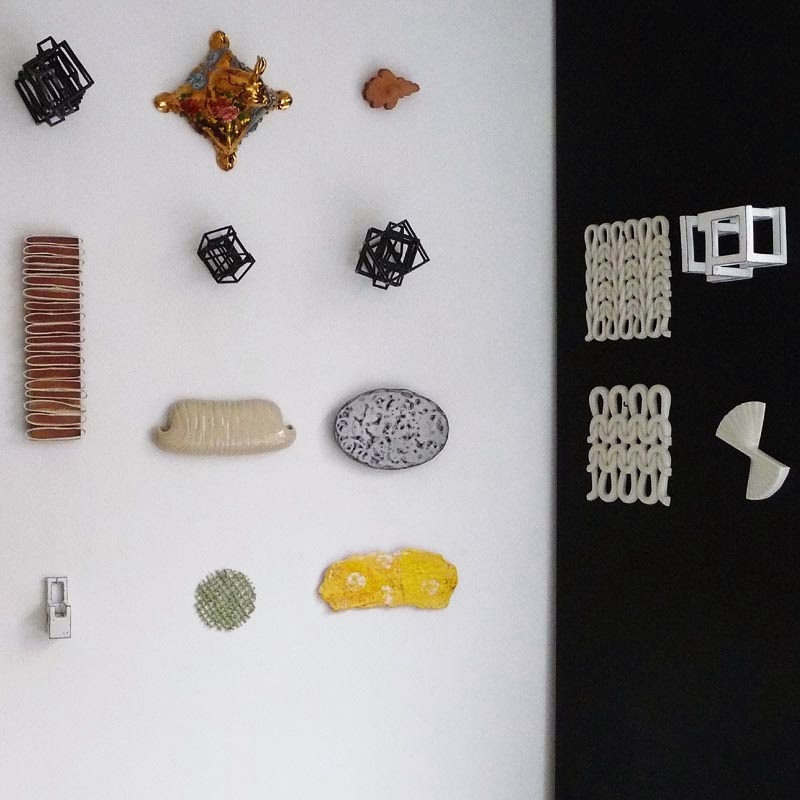 Always challenged by the characteristic qualities of the material and a desire to test limits of ability. 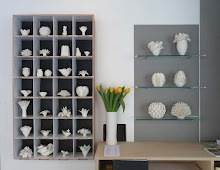 Prue Venables (Australien)makes the shift to porcelain the natural step for anyone looking for hardness and ringing clarity. 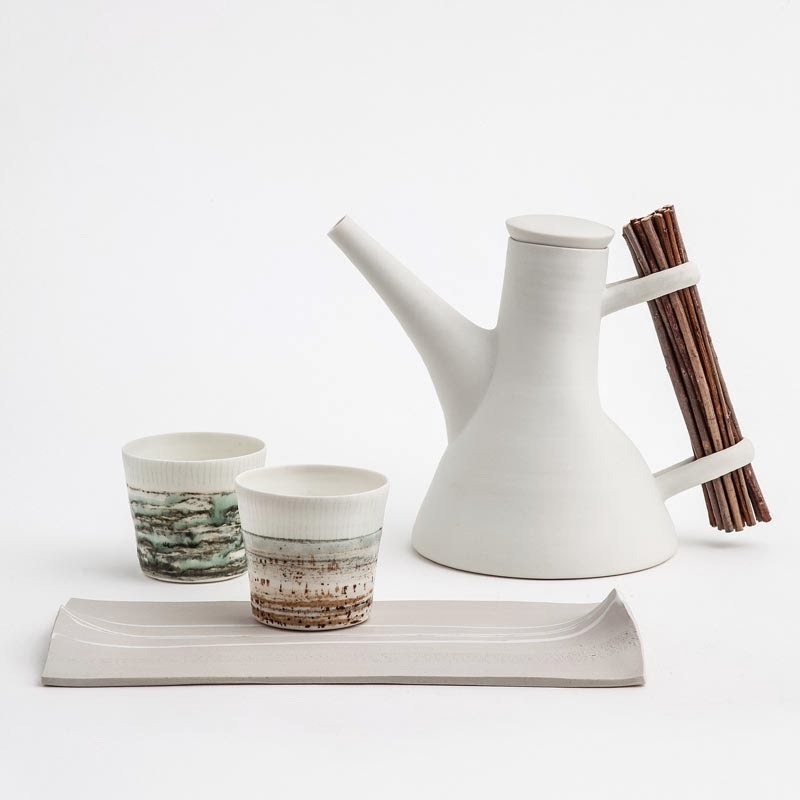 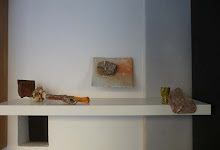 Her objects are confidently utilitarian, with deliberate but understated echoes of the purposeful crispness and functionality. 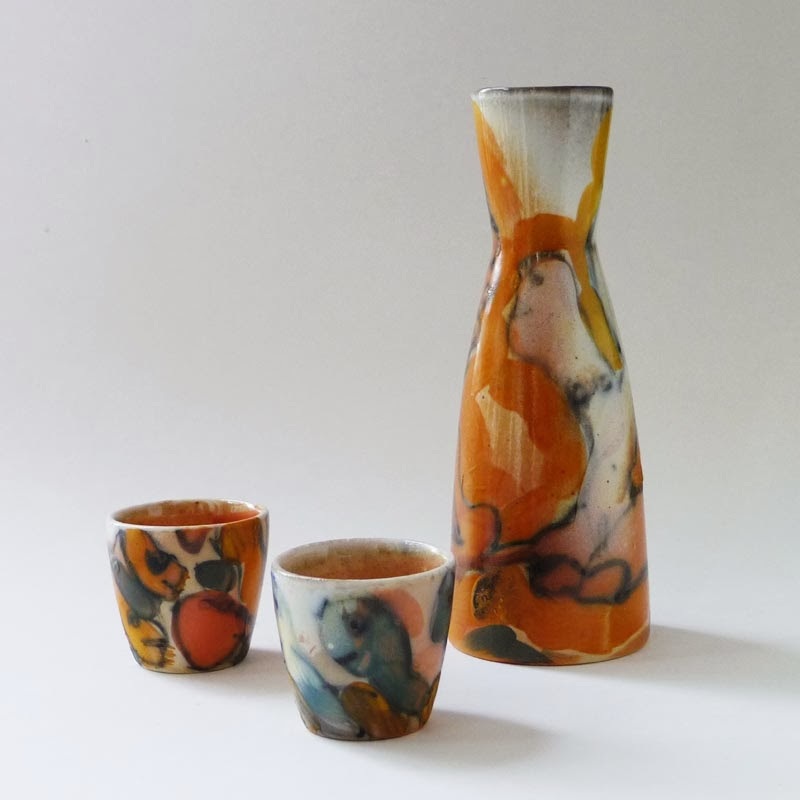 She is internationally recognized, lives and works in Australia.